So, today we get to pull our lost post back down out of the air. Ah, raven has it, as you can see. Good thing I love ravens. Caught between a fireplace and Madame Raven herself! But loving it. Look at how Susan Cain helped her put on her dancing clothes. Nice. There are principles in the world. One of them is the principle of the hole, or the mouth. This is not a favourite topic among the pigeons of the Peshastin Pinnacles. Another is the principle of eggs. Sometimes eggs and mouths are the same. Well, usually. The festival features emerging and established London writers and some of Canada’s most celebrated authors, poets and journalists reading and talking about their work and leading workshops on a variety of topics. Other familiar names attending the festival are Western University’s writer-in-residence Cherie Dimaline, London’s poet laureate Tom Cull and poet, performer and playwright Penn Kemp, whom Ricci met in Whitehorse at a similar festival in the early 1990s. 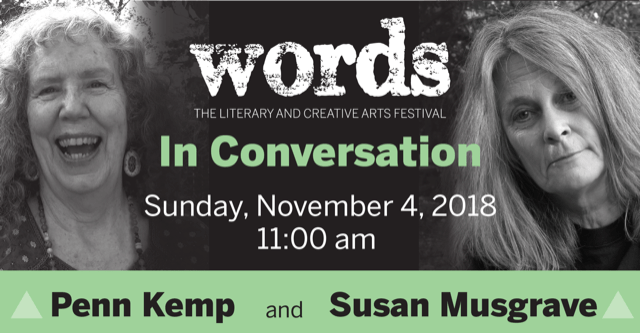 On Sunday, at 11 a.m., Kemp and poet and children’s writer Susan Musgrave will give readings and be in conversation with Western professor Allan Pero. “I love these festivals, both as an outreach to the public and as a way for writers to see each other,” said Kemp, 74, who served as London’s inaugural poet laureate and a Western writer-in-residence as well as the League of Canadian Poets’ Spoken Word Artist in 2015. Kemp said the “best” part of a Words festival is that it’s free (with the exception of Friday’s opening reception). “These are among Canada’s most accomplished writers and I’d suggest it’s essential for young writers to attend,” said Kemp. What: Words: The Literary and Creative Arts Festival featuring more than 40 authors, poets and other writers from the region and across Canada, presented by Western University, Museum London and London Public Library. When: Saturday and Sunday, 10 a.m-7 p.m.
Tickets: All events are free. Visit wordsfest.ca for a schedule and details. This weekend! November 2-4 at http://wordsfest.ca/! KUDOS galore to Josh Lambier for steering this grand festival through all five years! A marvelous achievement! Here’s celebrating our writers, near and far! I’ll be in THE POET LAUREATE PRESENTS, reading poems from River Revery (Insomniac Press, 2019) with Mary McDonald’s Augmented Reality presentation, https://riverrevery.ca. Wordsfest, Museum London Theatre, 421 Ridout Street North, London. River Revery is an ongoing collaboration about the Thames between Mary McDonald and me, sponsored by London Arts Council’s Community Investment Program and Libro. Our “In Conversation” sessions at Words Festival offer a unique combination of author readings, moderated dialogue, and questions from the audience! Meet local and visiting authors, discover literary work in a range of genres from poetry to loyalist histories to murder mysteries, and learn from a number of writing and publishing workshops – this is the Souwesto Book Expo!